First it was “bags for life”, chunky doormats and, more recently, clothing such as fleeces, swimwear and pack-away macs. Now towels made from recycled plastic bottles are to go on sale in the UK for the first time in August — the latest initiative in the war against single-use plastics and the result of a technological breakthrough that has produced a fabric deemed soft and fluffy enough to use on human skin. The new range of eco-friendly bath towels will go on sale online and at 18 branches of John Lewis in the last week of August, after nearly two years of extensive testing and work with suppliers. The polyester from the recycled plastic bottles accounts for 35% of their content, while the rest is regenerated cotton. The bath towel is made from about 10 one-litre plastic bottles, and John Lewis says that the use of recycled rather than virgin cotton will save about five tonnes of fabric from going to landfill each year. Plastic waste has become a charged issue, with TV programmes such as Blue Planet II exposing its impact on the oceans, and regular warnings being made over the dangers of a global plastic binge. But even before David Attenborough’s shocking exposé of marine pollution, retailers and manufactures had been seeking more innovative ways to use recycled materials, including plastic. “If there are sufficient collection and recycling facilities, then waste plastic can become a valuable resource,” said Trewin Restorick, the chief executive of the environmental charity Hubbub. “We are currently building our second boat from recycled plastic, which will be used on ‘plastic-fishing’ trips to clear more plastic litter from the UK’s waterways. The beer brand Corona and marine organisation Parley for the Oceans — which has previously created footwear and swimwear made from ocean plastic in collaboration with Adidas — have teamed up in a Clean Waves project to boost the use of ecologically innovative materials in fashion and design. Among the products is a new limited-edition Hawaiian shirt, designed by Adolfo Correa. It incorporates plastic pollution imagery — including toothbrushes and plastic bottles — into the pattern, while the fabric itself is made from plastic “harvested” from the open oceans, remote islands, shorelines and coastal communities. Elsewhere on the high street, the homeware retailer Lakeland reports a month-on-month sales increase of more than 20% of its “hug rugs” — anti-slip indoor mats made from 100% recycled materials (including plastic bottles) — which are in their turn recyclable. Perhaps with an eye on looming thunderstorms, Marks & Spencer has recently launched a pack-away mac, made with 50% recycled polyester sourced from plastic bottles. The mac — for men, women and children — has been designed as part of M&S’s sustainability plan, in which it has committed to at least 25% of its clothing and home products being made with reused or recycled materials by 2025. John Lewis’s white, cool grey or marine green towels, which will be sold under its Croft Collection brand, are certified by the Global Recycled Standard. This sets requirements for third-party certification of recycled content. A facecloth will cost £5, a hand towel £9, a bath towel £16 and a bath sheet £24. 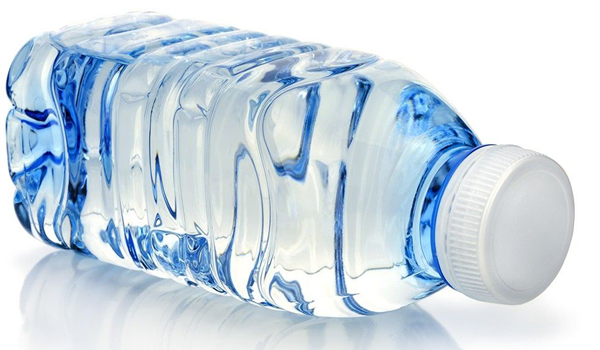 About 38.5 million plastic bottles are used in the UK every day. Just over half make it to recycling, while more than 16m are put into landfill, burned or leak into the environment and oceans daily. However, most plastic bottles used for soft drinks and water are made from polyethylene terephthalate (Pet), which is readibly recyclable.